I went downtown to get some peaches at the Albany Farmers Market. I got them, and I also ran into a bit of magic. Jeff McMahon hosts the “Valley Talk” program on KGAL Radio. On Tuesdays I usually join him (11 a.m., AM 1580) to talk about current issues in the news or whatever else happens to come up. Turns out that when he’s not on the radio or serving as the announcer for concerts in the park, he performs magic. Steve Peterson, left, and Jeff McMahon at the Farmers Market. 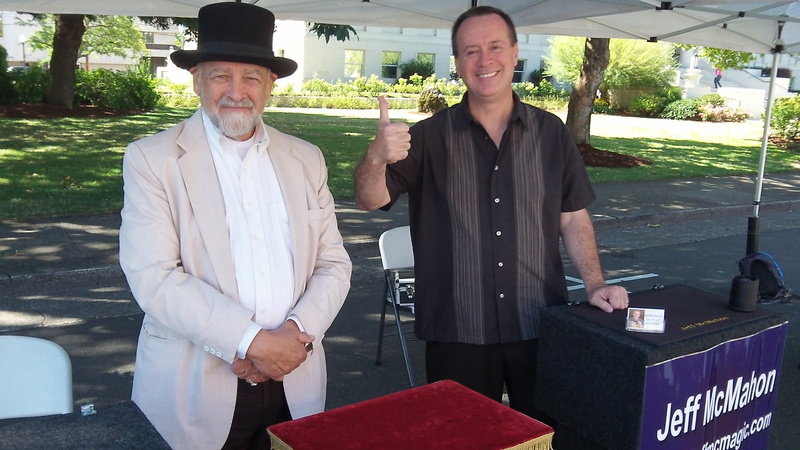 That’s what he was doing at the Saturday Farmers Market, alongside a fellow magician, Steve Peterson. While Jeff was conjuring up silver dollars out of thin air, Steve showed me a handful of five one-dollar bills and turned them into twenties before my eyes. Pretty neat trick if you need some quick cash. He would not, alas, do the same with some ones I had on me. Want to know more about Jeff and Steve and their illusions, or perhaps to book them? You can find Jeff at www.jeffmcmagic.com and Steve at http://minor-miracles.net.